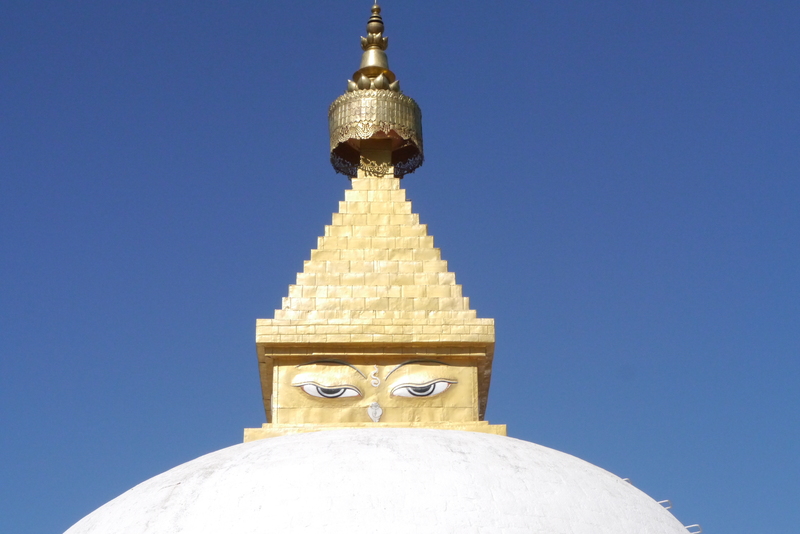 As we climbed toward Dochula on a winding, bumpy, unfinished road that connects Thimpu and Punakha, our driver Dorji jockeyed for position around a continual stream of anthropomorphic dump trucks. 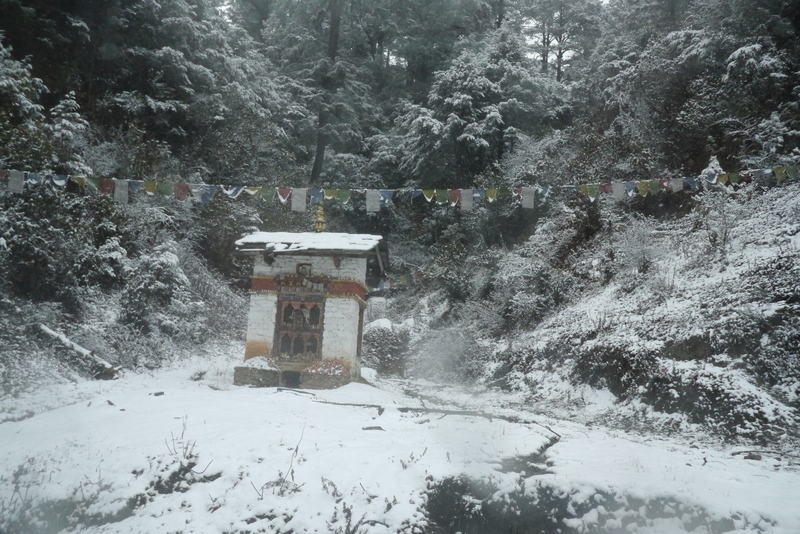 After about 30 minutes we began to see snow and by the time we reached the 3150 m peak we were in a white out. We couldn’t see a thing, but we were happy to stop and have a little lunch at the rustic café at the top. A group of American students on an Interim trip from Singapore American School engaged in rollicking snowball fight. 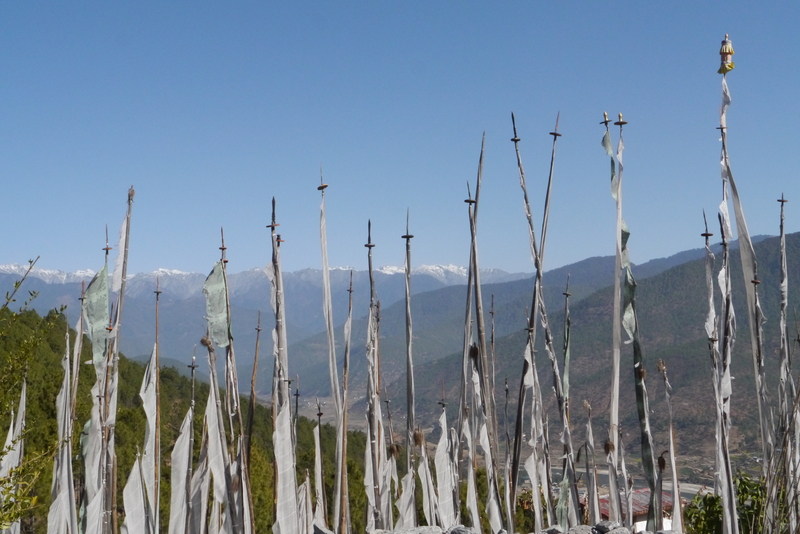 We ate a simple lunch, discussed rewiring consciousness in Christianity (as you do) and headed down the other side of the mountain to the breadbasket of Bhutan. Arriving in Punakha we went for tea and again engaged in a philosophical discussion, this time of sin and karma. Wow, Gembo’s intellectual stamina is formidable. I thought my head would explode during some of our teachings, as I just couldn’t take it all in. Gembo consciously chose places for us to stay that were not tourist hotels. Perched a solid 30 minutes above the main road into town, the local family farmhouse on three acres he carefully selected for us was a complete delight. 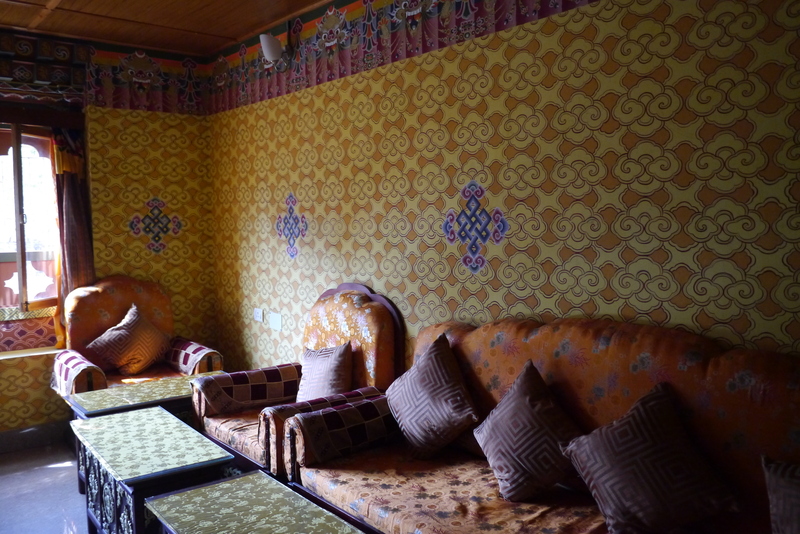 It was not at all fancy, but gave us the experience of living in a Bhutanese family home. The family went to considerable lengths to make us comfortable and though we were sometimes chilly, the beds she bought for our visit were warm and cozy and we had everything we needed. We were invited into her efficient kitchen when we arrived and we sat cross-legged on mats around the wood stove as we sipped hot sweet milk tea. Using ingredients from her garden and her cow, our hostess created wonderful meals she served in the main room of the farmhouse. As half of our group is Christian clergy, Sunday morning we had our own little Eucharist in the farmhouse before we headed out for our meetings. This was a first for all of us, as Gembo and Lam joined us for the service. With this simple ritual our group had reached a new level of intimacy and trust. It was another beautiful moment to add to the list. Our lovely breakfast was a meat porridge and brown rice with cilantro, onion, garlic, ginger and chilies. My new favorite. 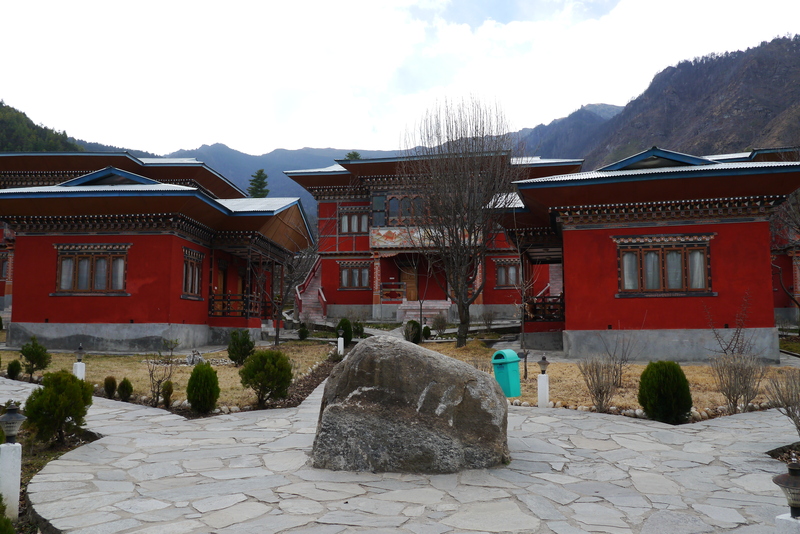 Tucked behind the stunning 17th century Punakha Dzong is a small government ministry building where we spent many hours over the course of the next two days. The main meeting room, elaborately painted in yellow and orange clouds topped by ornate dragonheads, is furnished with stately couches and low tables. His Eminence, Letshog Lopen Rinpoche, is one cool monk. He radiated confidence as he breezed into the room with authority wearing darkened shades and sporting a small mustache and long, thin Confucian beard. 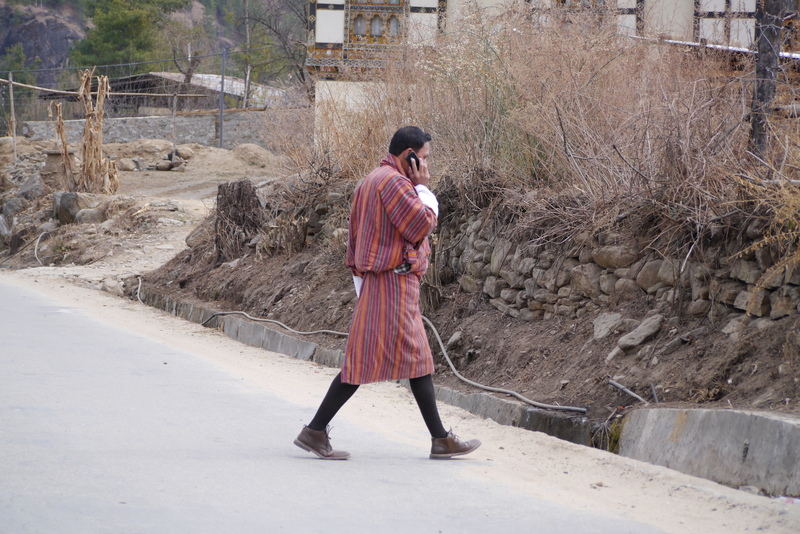 A scholar, philosopher and administrator, he was curious about our group and why we had come to Bhutan, and put Gembo through the paces translating all that he had to say. Sabina’s opening questions always set the tone for our meetings, demonstrating that we were here as practitioners and here to learn. Her skill earned our group respect and deepened the level of the conversations and interest in exchanging views. With closed eyes he would listen to our questions, then come alive with philosophical responses such as likening creation/realization to tasting an apple. Explaining that the taste itself is creation/realization, but when we talk of tasting, the processes that leads to tasting are the foundational steps and equally important as is tasting itself. Priming soil, planting the seed, water, sunlight, time… all of these elements prepare for that moment of tasting. To achieve Mahamudra, therefore, all steps are practices, attained within one’s mind along the path. Got it? After two intense hours of discussion, we shared a quiet catered lunch and then he abruptly bid farewell and left even before I worked up the courage to request a photograph. On the following day we met His Eminence Tshglop Rinpoche responsible for social service activities for the Sangha. Our conversation was entirely different, but equally enlightening. 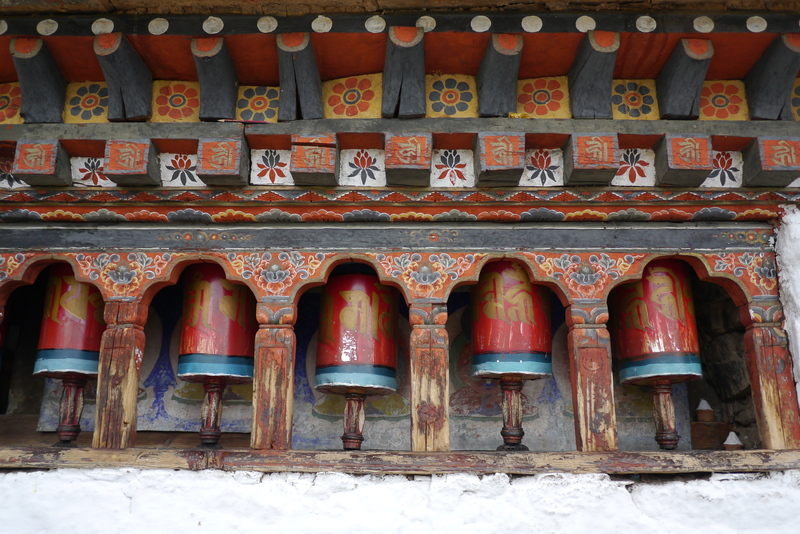 Establishing that we were comfortable and enjoying our stay in his country that might lack services but has happiness and tranquility, our conversation centered on effort, continual practice and service as key elements in the pursuit of mahamudra. I was interested to hear from him that among older monks, they rarely if ever see mental problems. He seemed to suggest a link between generation of wisdom and staving off dementia. After several hours in that room, and on the one day when bright sunshine beckoned us from outside the windows, we were restless, but we had another remarkable moment just ahead. Our driving companion and quiet, good natured friend, “Lam” who had accompanied us for two days practicing English and bantering about the food now changed hats and joined the list of respected experts with whom we shared dialog. 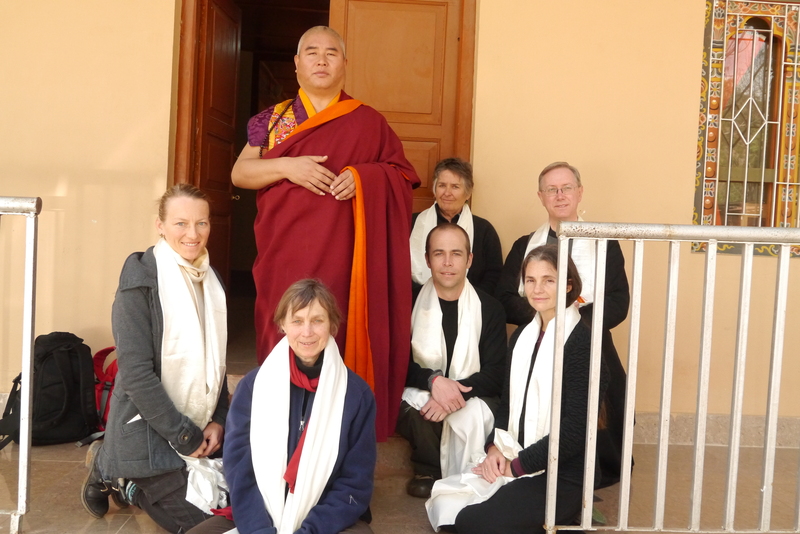 Gembo translated as Lam Jampel Sangay, District Abbot of Pemagatshel District Monastic Body shared with us his deep knowledge and reassured us that the key element of spiritual practice is to have faith in the path we choose. As long as we have total faith, we are on the right path. This wisdom, among many other pithy teachings Lam shared, made staying inside a little longer worth every second. With the mornings spent in meetings, our group was anxious to move our bodies in the afternoons and of course Gembo had a plan. 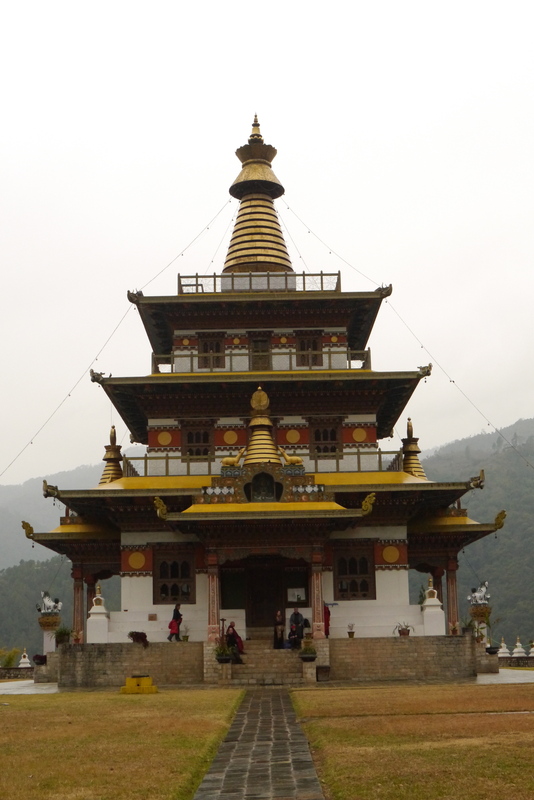 On the first afternoon, we hiked to Khamsum Yuley Namgyel Chorten, a newer temple built by the queen mother with a massive mandala in the center “Victorious diety over the three worlds” and a stunning 360 degree view of Punakha valley from the top. We discussed fear and imagery and whether they are learned or ingrained. Mom wondered if Yeung might take issue with Gembo’s assertion that fearis conditioned; that the images are not inherently scary. We heard about the divine madman and his antics on the way up, and about temple architecture as we descended in a rainstorm. 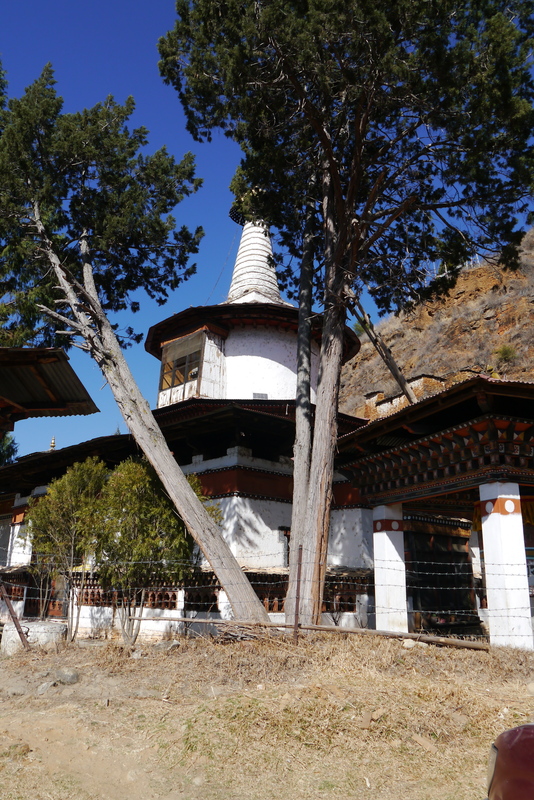 On our second afternoon in Punakha we visited both Punakha Dzong and Khuruthang Lhakhang, the latter of which had survived a terrible flood. When we finally returned to the farmhouse in the evenings, we were treated to a lovely stone bath one night, dancing with the host’s adorable eight-year-old daughter, and deep conversations over lovely hearty meals. On our way out of Punakha we stopped at a nunnery where we met a lovely young nun named Pema who gave us bracelets and told us she would pray for us. She spoke perfect English, and was articulate, earnest and soft-spoken. 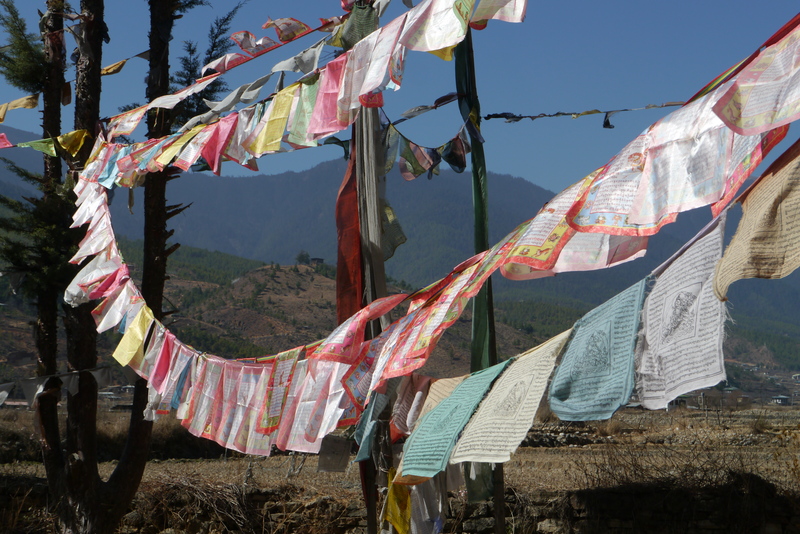 Though we all could have stayed in Punakha for much longer, it was time to begin our journey home. Rwanda is an optimist’s paradise. Naysayers and cynics move along. This post is rife with inspiration, innovation and resilience in a country that 19 years ago was in unimaginable turmoil. Continual controlled panic was the way I described my visit to Rwanda in October 1994, just months after a brutal genocide saw the massacre of a million people in 100 days. On that visit I slept on the floor of the destroyed Ministry of Health office in Kibungo, eerily listening to dogs howl as they raided shallow graves for sustenance. Tufts of hair and pools of blood still stained the floors of the new office space under consideration, and we’d speed up as we passed churches still full of the remains of those who’d fatally reasoned that the church would be a refuge rather than a mass grave during the worst of it. I never saw a dead body that trip, but empty villages and the smell were enough to connect the dots in my imagination. I never thought I would return. Ever. Yet last week that’s precisely what I did. Invited as a strategic advisor to Vision for a Nation, a registered UK charity with a mission to make vision assessments and affordable eyeglasses available to all, I traveled to Rwanda and spent three remarkable days consistently impressed and inspired by what I saw and experienced. With 11 million people in Rwanda, Vision for a Nation’s goal to give every person (over 8) in the country an eye exam and provide relief for correctable refractive error is ambitious, but now that I have been there and seen their approach, I believe it is possible. VFAN was born from a simple adjustable lens technology and ‘train the trainer’ model that enables nurses to diagnose and correct refractive error in the 45 health centers throughout the country. The adjustable glasses have dials on the sides which, when rotated, slide one lens in front of the other until the unique prescription is achieved. Those with refractive error walk into a health center and walk out with glasses completely eliminating the need to return to the center to pick up custom glasses or the inefficiencies of pairing donated glasses from the developed world with end recipients. It’s inexpensive, efficient and instant gratification. Other benefits include diagnosis and treatment of cataracts, conjunctivitis and other easily treatable eye ailments. Working in partnership with the Ministry of Health, VFAN will soon launch a public awareness campaign through a highly organized communication system in the country to educate and inform the public about vision care. Eye care is generally not a life saving intervention, but it certainly improves quality of life. This is one of many public health initiatives the MOH has embraced to improve the lives of those in Rwanda. Speaking of the Ministry of Health, we were fortunate to have a private dinner with the remarkable Minister of Health, Agnes Binagwaho one night in Kigali. The list of health initiatives she has implemented to improve the lives of Rwandans is impressive. She is entrepreneurial, philosophical and pragmatic with a “can do” attitude I’ve never seen before in Africa. She’s a total pro. Dinner conversation included great one-liners like, “The best idea on the table is the one I take.” “Money will come. Good strategy is the important thing.” “I want to die happy of what I have achieved. I don’t want to be the richest in the cemetery.” Her initiatives include the 80/40/20 plan to reduce non-communicable diseases (NCDs) by 80% for those under 40 by 2020. To do this she began by implementing very concrete public health changes including mandating helmets for motorbikes, seatbelts, banning smoking in public places, cooking stove improvements and other initiatives that didn’t cost much, but had a huge impact. She was the first to offer the HPV vaccine, countrywide, to schoolgirls of a certain age. Her work in reducing HIV AIDS in the country is legendary. Her entire staff has all gone to graduate school at the expense of the ministry and many are beginning PhDs now. Government workers are mandated to do an exercise of their choice on Fridays during the workday and pay a fine if they do not. She regularly tweets (as does the President) and responds to every tweet she receives. She has 10,000 followers and has a regular Monday with the Minister show two times a month to address public health issues. The Honorable Minister is a global health leader, not only for Rwanda. I was honored to share a meal with her. Rwanda has two unique programs that contribute to its continued growth and improvement. If I understand correctly, the Muganda is a compulsory gathering the last Saturday of every month at which time the entire country, divided into local communities, comes together to work from 7-10 on an improvement project and then from 10-12 to meet and share information. They will paint a house that has fallen into disrepair, collect trash, build a road, or anything that the community deems as an improvement. As a result, the country is tidy, fresh and continually improving. Similarly, the Urunana radio programs reach an unprecedented percentage of the country with a soap opera-like ongoing storyline. Intertwined in the programs are community health and agricultural messages. This is one of the primary vehicles for spreading information throughout the country. So radio that was once used for inciting violence is now used in a similar way for improving lives. Beyond health initiatives, last spring, in preparation for the TEDxHappyValley “Radical Resilience” event in Hong Kong, I was teamed up as a speech coach for a remarkable 27-year-old entrepreneur Elizabeth Dearborn Hughes, founder of the Akilah Institute for Women in Kigali. Elizabeth taught me more than I her during the process. 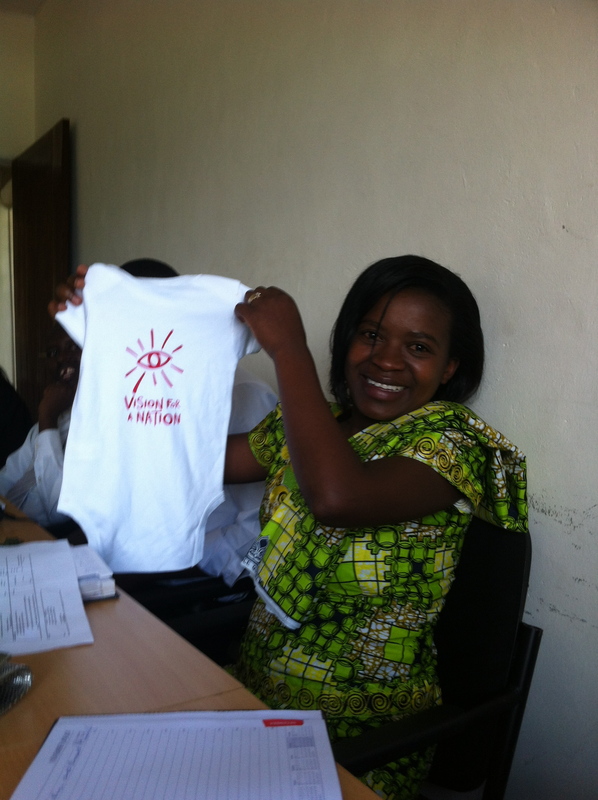 When I agreed to go to Kigali, I knew that a visit to see Akilah would be important. 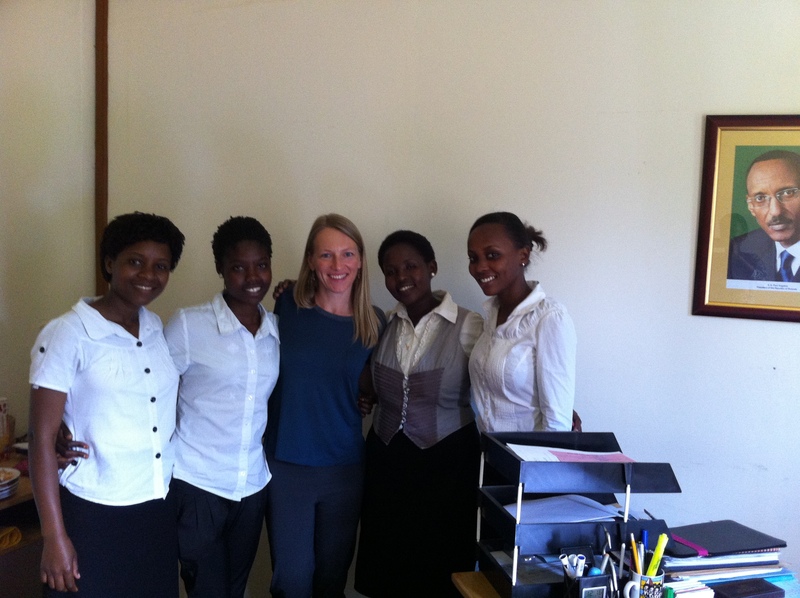 Akilah Institute for Women is a three-year training program for women. Women apply, take an entrance exam, provide references and interview for spaces at Akilah. Those selected do a foundational year of math and English language as well as leadership training and then embark on a two-year program in one of three disciplines, entrepreneurship, information management or tourism. Women receive career counseling, do internships, and continue with leadership training and practical skills development throughout their studies. The first graduating class in 2012 had 100% job placement. I had the honor of having lunch with four of their current students. I was completely inspired and humbled by their poise, intelligence, determination and vision for their futures. I can’t say enough good things about Akilah! If you’re looking for a good place to invest in women’s education, this would be my top recommendation. Above and beyond these formal gatherings, I was inspired to meet others who are consciously building businesses in Rwanda. A friend of a friend has launched an organic coffee farm on his family’s heritage land after having fled Rwanda in 1959. Upon returning, he was given back his family land and is now gently learning the coffee business, producing some of the world’s finest artisenal products. I can’t wait to try some. A dear friend of mine, Rachel Radcliffe, made the effort to fly all the way from Nairobi to visit me during my short stay in Rwanda. I was so touched and happy to see her! We worked together 20 years before at OFDA and have both led circuitous international lives since then. Reconnecting with an old friend from those formative years was grounding and inspiring. I feel so blessed. Returning to Rwanda under much better circumstances was cathartic. I know it isn’t perfect. I’ve read the articles and heard the naysayers about Rwanda, but in this post I choose to see the country as it should be, celebrating those things that are working and truly inspired by earnest, innovative efforts on the parts of so many people to make things good in a place that hasn’t always been so. Several years ago, when my son was quite small, my mother gave me a book to read. It sat on the shelf for a few years, unopened, and eventually I gave it away. A few years later she gave it to me again, and again it sat on the shelf. When we moved overseas, the book was chucked in a box and sat in a dark storage place for five years until we bought a house and liberated our treasures. Two years ago I found the book and carried it with me all summer and back to Hong Kong, still never cracking the spine. I had a niggling sense that this book was important, but I wasn’t ready for it until yesterday. With deadlines for projects I’ve assumed looming, I should have taken the rare moment of quiet on a Sunday afternoon to tackle my in-box. Instead, my children busy with their friends and my husband grouchy, I retreated to the bedroom, pulled this book from the shelf and devoted the afternoon to discovering its teachings. The book is Bill Plotkin’s Nature and the Human Soul. Cultivating Wholeness and community in a Fragmented World. That same evening, checking Facebook, I saw that a friend tagged me in a post linked to a new television ad for Toys R Us. The ad depicted a busload of children on their way to a field trip in the woods who are then re-directed to the toy store instead, much to their great enthusiasm, and at the expense of a day in the forest. Here’s the clip. Must ask it permission to know it and be known. Toys R’US didn’t do anything wrong with their ad. In fact, there’s probably not one among us who didn’t at one point during childhood fantasize about a free trip to the toy store. They’re simply appealing to our collective voracious appetite for stuff and the delicious prospect of getting it for free. But to have it so blatantly preferable to a day in the woods underscores that precise uncoupling of humans and nature that is as internally damaging on a personal level as it is externally to the planet. I’m not a preachy environmentalist, but I think this book is skilled at linking a general human malaise and despondency with a very tangible explanation. So, whether this post makes you want to go to Toys R Us to stock up for the holidays, or take a walk in the woods will probably explain a lot if you choose to listen. I, for one, am going hiking…um, after I pick up a few things from the store. RAMP… on or off, we’re still moving forward. If work life is a journey to be traveled, rather than a destination to be reached, there are bound to be stops along the way. Think of your career as one long, fun road trip. You travel along, at first in a stroller, upgrading to a bike, your first car, a nicer model, a sensible minivan, the midlife crisis sports car and eventually a practical Subaru (avoid the wheelchair, if possible!) and then a nice porch rocker if you’re lucky. But on any road trip, there are pit stops, exits and entrance ramps. These are a natural part of any trip. When you get off the freeway for a little break, you don’t abandon your car and never look back. Instead, you park it for a while, rest, refuel and get back on your way. Why can’t your career be like this too? RAMP is a network of individuals who view their career path as a journey rather than a destination, but who recognize the need to continue to grow, whether employed or not. RAMP is a social movement designed to get society to stop valuing each other by our professions, but by our intrinsic character and essential selves. RAMP is a practical resource for skills building, networking, career curation, support and advocacy. RAMP is a membership-based organization, app and website that links workers with employers, or needs with skills, for project based work for individuals who are taking a break from a career, but still want to be professionally engaged. The goal of RAMP is to become a system for aiding the off ramping and on ramping of individuals from professional career paths to family care roles and back. The goal is nothing less than raising both society’s labor productivity and also the overall level of emotional wellness in society. Improving social productivity in this way is an increasingly urgent economic need given aging demographics in most countries and extensive welfare spending. Many highly skilled and educated people, predominantly women, are dropping out of the workforce in order to assume the role of primary care provider parent in their own household. With long work hours and complicated societal demands for engaged parenting, households that can financially afford a division of labor where one is the primary bread winner and the other the primary domestic manager are feeling forced to make this difficult choice. Increasingly this has become an all or nothing scenario, which has created an economic inefficiency that should be addressed. Educating a sector of the population that then fails to contribute directly to the economy is time consuming, expensive and inefficient. Beyond the economic inefficiency of educating an ultimately “non-productive” sector, choosing to leave a professional life has psychological implications that negatively impact self-esteem, divorce rates, substance abuse and so on. The Five O-Clock glass of wine that is joked about in just about every “mommy blog” or New Yorker cartoon is actually damaging and, I theorize, a sign of deep despondency and lack of satisfaction and happiness in life. One of the biggest things a primary care parent misses is recognition, professional growth and feedback. Volunteering for worthy causes can help alleviate that, but for individuals to truly engage in nonprofit volunteer work they need and deserve a more formalized system of recognition and feedback that contributes to the continuity of their resumes. This will improve the quality of the commitment volunteers make to the causes as well. A Harvard Business Review survey found that 37% of highly qualified women were “off-ramping” (voluntarily leaving their job for extended time periods) and that “three quarters [of the women surveyed] were on nonlinear career trajectories to the detriment of their earning potential and career advancement.” (HBR Magazine, June 2010). The root of the mommy wars is not judgment of the other, but vulnerability and guilt. RAMP can address these issues by helping primary care parents maintain their professional skill set, sense of self worth and purpose by keeping them responsible to continually contribute to the world beyond their own families. Rather than just drop out altogether, RAMP helps individuals create a work plan that will enable them to continue to build new skills and keep old skills fresh, and to take on projects that utilize their professional talents but still maintain schedule flexibility which is the single biggest need for primary care provider parents. 1. On-line database for skills-based project work – For people with specific skills who don’t want to work full-time, but could take on projects. The employer doesn’t have to pay benefits and can get specialzed skills and expertise that they don’t have to have in-house without making a long-term employment contract decision. Similar in concept to legal services firm, Axiom, individuals could even eventually work for RAMP and be hired out for projects, getting insurance and other benefits from RAMP. 2. Political Advocacy – Want to make a real difference? Join the RAMP Advocacy Team in being an advocate for primary care parent protection by lobbying to make changes at the government level. Could social security benefits be shared for couples who choose to have one parent stay home to take care of children? Paternity leave benefits? On-site child care? Do research and let your voice be heard to help other families navigate these important decisions better in the U.S.
3. Networking & Community Organization – There is power in numbers. One of the biggest concerns of stay-at-home parents is the isolation and lack of professional network they had when they “really worked.” RAMP offers both an on-line and in-person gathering for members. Those in the same city can meet in a common location to work together, bouncing ideas off each other and perhaps sparking innovation. Another example would be an increased efficiency and transparency to alleviate the mommy wars. Instead of “stay-at-home-moms” feeling put upon by working mothers who continually ask for favors without reciprocating, organize a system where stay at home moms help working moms on an up-front basis and get some kind of compensation/recognition for it rather than favors with judgment. Mothers could join the after-school brigade coordinating carpool rides to after-school activities, hosting homework groups at their houses and so forth. Working mothers would know that their kids were in the hands of other mothers. Working mothers would spend RAMP stamps by the hour, while stay-at-home parents who agree to volunteer earn the stamps. RAMP Stamps can be spent to sponsor other members, or for guidance, personal training etc. 4. Alternate Currency – An alternate structure for RAMP might include a website/app that would match skills with needs and earn members a form of currency called RAMP Stamps. The website would keep track of bankable hours that could be spent for other services by RAMP members. For example: One RAMP member is an accountant. She is “hired” by another member to create a family budget, which takes her five hours. She banks five RAMP Stamps. The accountant then decides she wants a balcony garden and finds a landscape architect through RAMP to plant a garden for her, which takes four hours. She spends four of her RAMP stamps on the garden. The landscape architect wants to relax with a regular yoga lesson, so she finds a yoga teacher on RAMP and spends her earned RAMP stamps, one hour at a time, on yoga and so on. The transaction requires feedback from both parties, but no cash outlay. This gives the “employee” a professional track record that helps keep the resume current and growing even though she isn’t formally employed at the time. It also gives the “employer” services without spending money, an issue for non-income-earning spouses. Modeled on Paperless Post’s stamps, RAMP Stamps can also be used to sponsor other RAMP members who can’t afford the membership fees or be spent on needed services. This will build the RAMP network along socio economic lines and encourage the spirit of RAMP in helping people help others. Clearly this is a half baked thought exercise, not a business plan, but I wonder if it resonates with you and if you have any additional thoughts?